Hello everyone! The Anvilbreaker F2P Run is over. I completed the Fiend deck within 30 days, then reached Gold on the Ladder in the next 3 days, to finish the F2P run in 33 days. Rewards in Solforge are extremely generous. I earned 84 tickets for 30 days of playtime. Why 30 and not 33? Well, I sometimes did multiple drafts in a day, but spread out the blog posts to just one per day to make it more realistic. 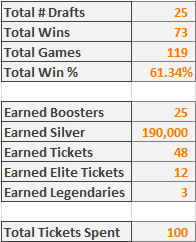 The real evidence for my “draft all heroics” strategy for building up a collection lies in the Silver Earned from Scraps. I earned 440k Silver from scrapping. My deck only cost me 760,000 Silver, which means that a majority of my deck came directly from drafting and scrapping excess cards, rather than opening cards. There’s a few things we can take away from these stats. The first is that win rate does play a bigger factor in amassing a collection than the previous F2P run. I earned 190,000 Silver from draft rewards alone and averaged about a 60% win rate. That means I expect to go 3-2 when I enter a draft. While I consider this record poor for myself, it is a fine record for a new player, who is probably hovering around 1-2 or 2-2. One thing to note is that you still get to keep all of your cards. So although win rate does have an impact on rate of card acquisition, it is still less than that obtained from scrapping cards (190k vs 440k). This changes only if you have the time to draft more than once per day, so you will find yourself more limited by tickets than anything else. Weekend Warrior is still really good value, since it is quite easy to play in a lot of queues with only a 2 ticket entry. The main draw is the Guaranteed Legendary Draft. This is HUGE for building a collection, since you have a shot at getting a lot of good legendaries this way as long as you are saving up your tickets. Ladder has unknown value, as I do not know what the rewards for Ladder is at the time of this writing. However, I wanted to include these stats so people knew how long it took me to climb from Bronze to Gold with my budget Fiend deck. The answer is 35 games with an 85% win rate. This is a large win rate that I wouldn’t expect a new player to have, but it does demonstrate how easy it is to climb to Gold with even a budget deck if you know what you are doing. Players can climb ladder with even a small collection, but need practice in order to do so. For what it is worth, these are the only 35 games I have played with the Fiend deck / archetype. I had not played the card Indomitable Fiend prior to forging it on this account. This particular deck is not very challenging to play, since you do not have to worry too much about creature positioning or combat math (your creatures are all huge). In the last F2P Run, I demonstrated that a budget deck could compete in queues without spending any money, given time. It took 64 days. This time, the F2P run took 33 days (and possibly as few as 22 days if I had built Zombies again). Nothing has changed in terms of strategy, but the rewards have gotten significantly better. Collecting dailies and drafting with extreme bias towards heroics will build a collection quickly, even without above-average play skill. The hard part lies in communicating this advice to new players. Don’t let them struggle trying to grind ladder with their starter decks and complain about those dirty netdeckers! If you see a new player, tell them about this raredrafting strategy. Explain why it works. You can link them to this page, if you would like! This project isn’t for me or for any experienced players. This project is for the people out there struggling to build a collection because they don’t know what to do. Help them out if you see one in need. P.S. – If you guys would like to see any specific content relating to Solforge in general, please let me know! Gard, It looks like about the last 5 days worth of videos are marked private…they currently won’t playback. Could you fix this? Thank you for this great playthrough! It helped me a lot as a new player. I am going with Heroic bias from the beginning at draft and haven’t regretted it yet, so I can fully agree with this strategy. Heroic’s 5k scrap value is just awesome. I am currently working toward your Indomitable Fiend deck (just lacking 2 Immortal Echoes by now, not counting Remembrances which I replace), lets see if it will do as good to me as it did to you. 🙂 I usually prefer challenging decks as I like to think deep into the game, but you just need the best budget grinder out there to reach the point where you have enough legendaries to build those strong decks. Personally, I would replace the Remembrances with 2 Xithian Tormentor, and possibly one other card with an Explosive Demise. Wouldn’t they mess up with your Graveyard and Immortal Echoes? I chose Spiritcleaves to have a better shot at taking out the big guys like Chrogias or Wegu. Yes, they would. But that’s okay, since they are still very large, help put fiends into the graveyard, and give you something to draw other than Indomitable Fiend to help the deck out of a lot of its “all my draws are garbage” phase.